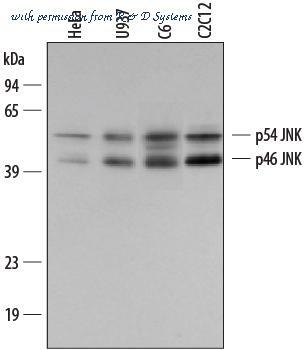 The JNK antibody from Proteintech is a rabbit polyclonal antibody to a peptide of human JNK. This antibody recognizes human, mouse antigen. 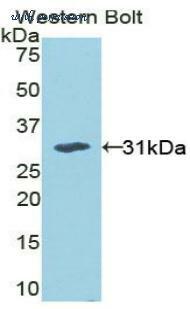 The JNK antibody has been validated for the following applications: ELISA, WB, IP, IF analysis. 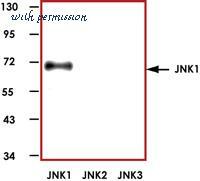 The JNK antibody from Proteintech is a rabbit polyclonal antibody to a fusion protein of human JNK. This antibody recognizes human, mouse antigen. 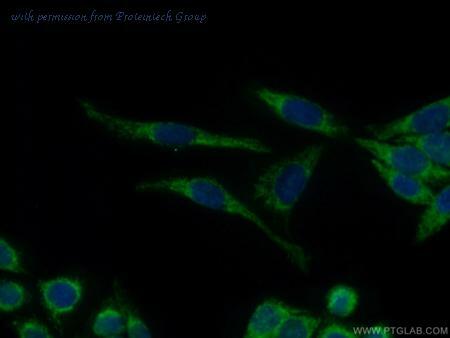 The JNK antibody has been validated for the following applications: ELISA, WB, IHC, IP, IF analysis. 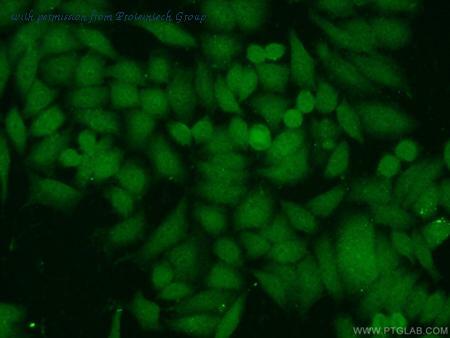 The JNK antibody from Proteintech is a rabbit polyclonal antibody to a recombinant protein of human JNK. This antibody recognizes human, mouse, rat antigen. 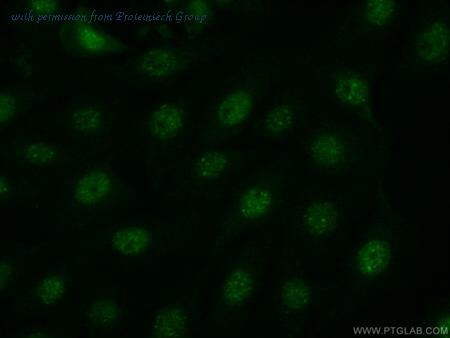 The JNK antibody has been validated for the following applications: ELISA, WB, IHC, IP, IF analysis. JNK in Human Breast Cancer Tissue. 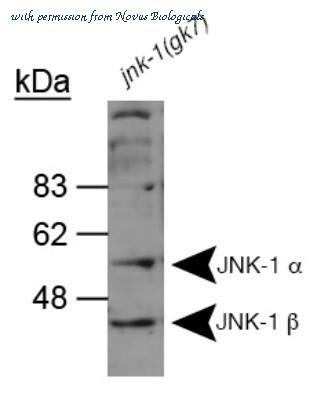 JNK phosphorylated at T183/Y185 was detected in immersion fixed paraffin-embedded sections of human breast cancer tissue using Rabbit Anti-Human/Mouse/Rat Phospho-JNK (T183/Y185) Antigen Affinity-purified Polyclonal Antibody (Catalog # AF1205) at 15 ╡g/mL overnight at 4 ░C. 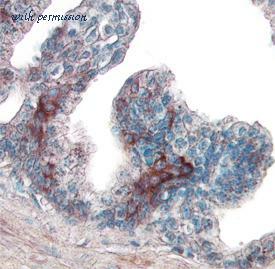 Tissue was stained using the Anti-Rabbit HRP-DAB Cell Tissue Staining Kit (brown; Catalog # CTS005 ) and counterstained with hematoxylin (blue). 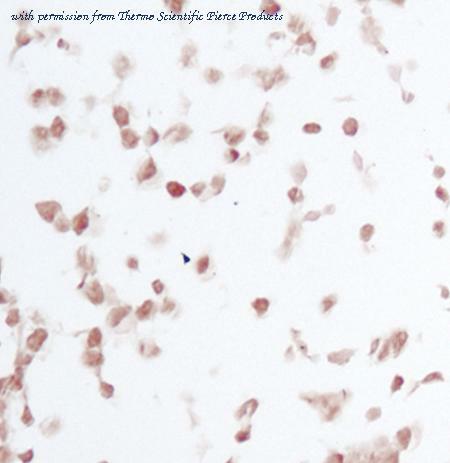 View our protocol for Chromogenic IHC Staining of immersion fixed paraffin-embedded Tissue Sections . 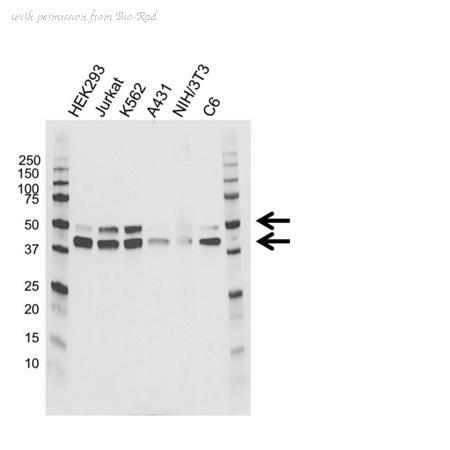 Detection of Human/Mouse/Rat JNK by Western Blot. Western blot shows lysates of HeLa human cervical epithelial carcinoma cell line, U937 human histiocytic lymphoma cell line, C6 rat glioma cell line, and C2C12 mouse myoblast cell line. PVDF membrane was probed with 0.2 ╡g/mL Rabbit Anti-Human/Mouse/Rat JNK Pan Specific Antigen Affinity-purified Polyclonal Antibody (Catalog # AF1387) followed by HRP-conjugated Anti-Rabbit IgG Secondary Antibody (Catalog # HAF008 ). Specific bands for JNK were detected at approximately 46 and 54 kDa (as indicated). This experiment was conducted under reducing conditions and using Immunoblot Buffer Group 1 . Detection of Human, Mouse, and Rat JNK1 by Western Blot. Western blot shows lysates of CHP-100 human neuroblastoma cell line, C6 rat glioma cell line, and C2C12 mouse myoblast cell line. 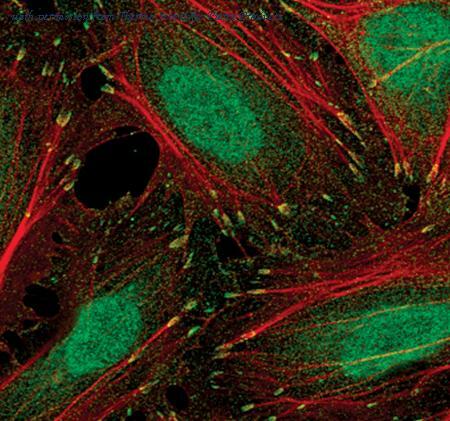 PVDF membrane was probed with 1 ╡g/mL Mouse Anti-Human/Mouse/Rat JNK1 Monoclonal Antibody (Catalog # MAB17761) followed by HRP-conjugated Anti-Mouse IgG Secondary Antibody (Catalog # HAF007 ). 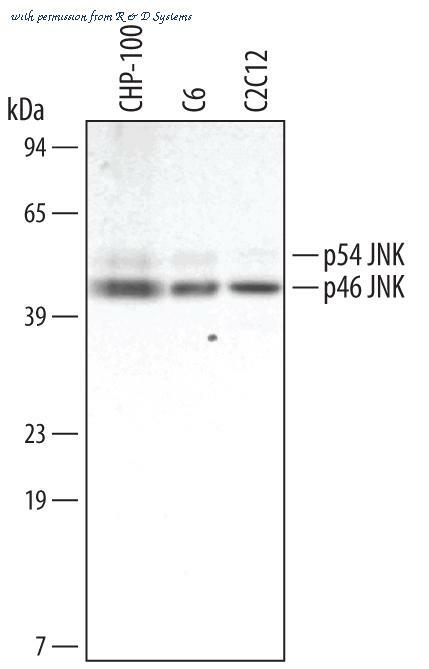 A specific band for JNK1 was detected at approximately 46 kDa and 54 kDa (as indicated). This experiment was conducted under reducing conditions and using Immunoblot Buffer Group 4 . 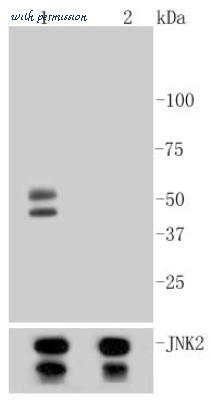 Western Blot: JNK1 Antibody [NB100-1925] - Detection of JNK-1 using NB100-1925. 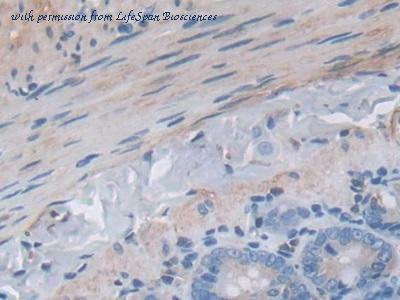 Immunohistochemistry analysis of human hepatoma tissue with Jnk1 mAb (5D10). Western blot analysis of serum starved cancer cells A431 (1), A549 (2), SKOV3 (3), OVCAR5 (4), HaCat (5), PC3 (6), HeLa (7) and HepG2 (8), probed with Jnk1 mAb (5D10). Representative western blot with Anti-JNK1 (1:250) using 20 ng of JNK1, JNK2, and JNK3 recombinant protein. 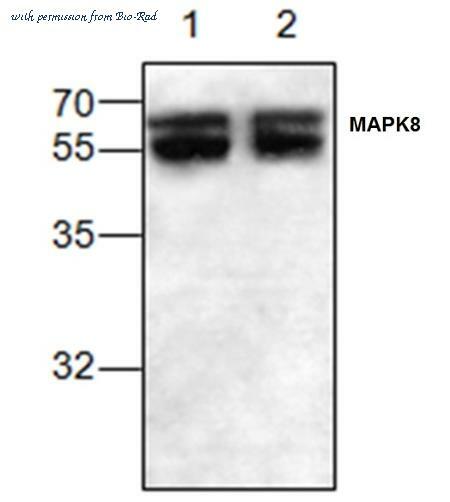 Western blot of recombinant MAPK8 / JNK1 / JNK. This image was taken for the unconjugated form of this product. Other forms have not been tested.